1959 Cadillac Coupe De Ville. This classic White American wedding car from the 1950's is magnificent, a real head turner and a photographers dream. 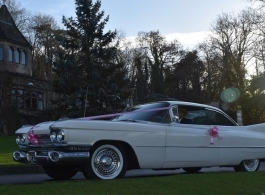 A truly stunning choice of wedding transport, there can be no better way of turning up to your wedding venue than in this American classic.